It’s about immersion blenders. I can only say I LOVE this tool. I use it for everything. And I’m going on record here and now to say that if you don’t have one, get one. You’ll thank me and yourself over and over. This is THE tool that takes your cooking processes to a professional level. There’s not one brand that’s better than another, and they’re reasonably priced. 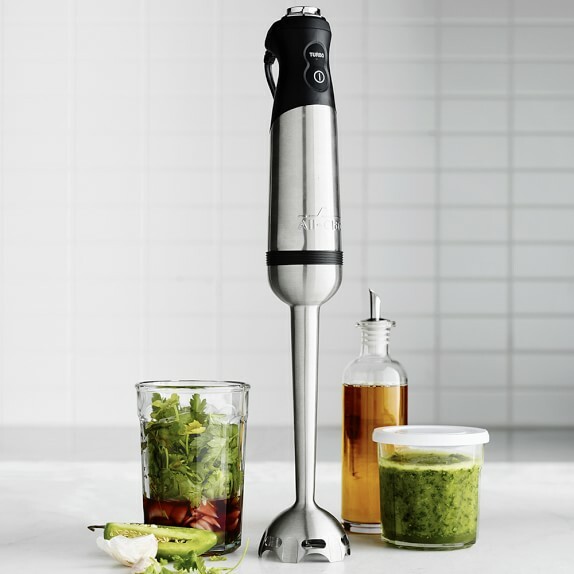 You can get a good immersion blender for under $40 – try finding a high-quality food processor for that price! (Spoiler alert: you can’t). It only took me a couple months of stealing from my grocery budget to be able to buy mine. I chose the Cusinart Smart Stick 2 Speed Hand Blender ($35.00). It’s small enough that you can hold it with one hand but big enough to tackle large pots of sauce or soup. It comes with a plastic beaker for whipping small jobs. It DOES have a cord, so keep in mind that you have to have it plugged in to use it. 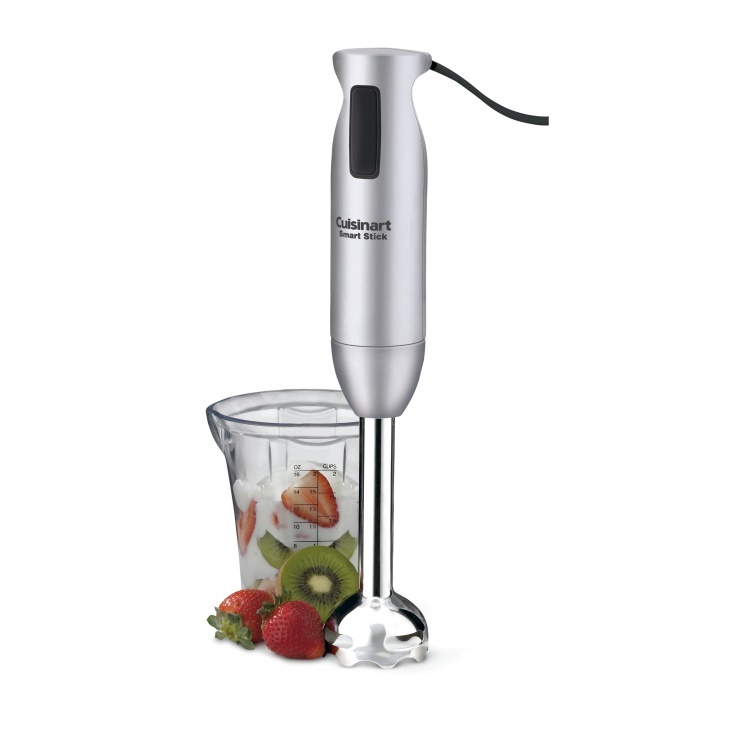 It’s also the #1 selling hand blender on Amazon and has an average 4.6/5 star rating from more than 2,900 reviews! Immersion blenders are compact. 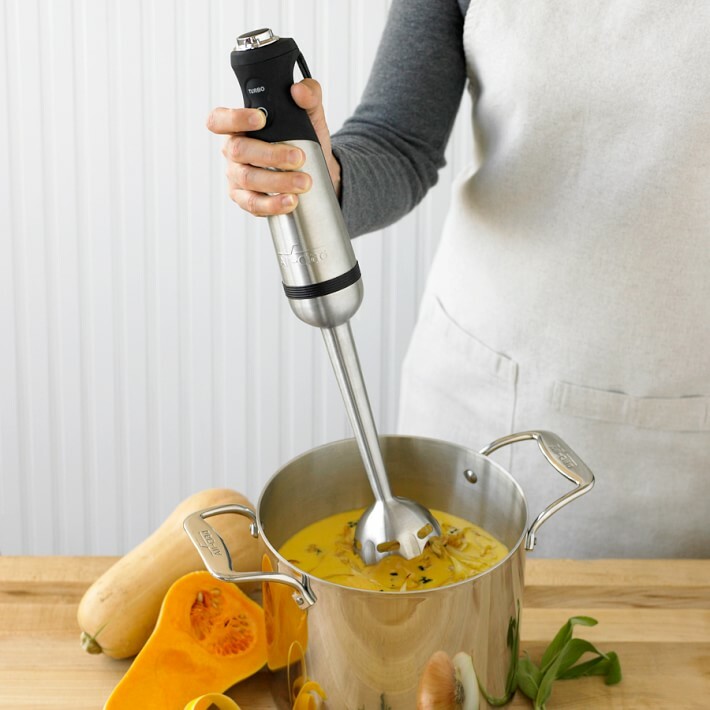 My hand blender takes up almost NO space – it’s small and fits just about anywhere, which makes it PERFECT for tiny kitchens. They cut down on cleanup. The greatest thing to me about using an immersion blender instead of a bigger appliance is that I’m left with hardly any cleanup. Just clean the blender piece and whatever bowl or pot you blended your creation in, and you’re wham-bam-done! They’re versatile. When I try to talk people into buying an immersion blender the most frequent hesitation is “but I don’t make soup that much.” WHAT?! People, these hand blenders can do SO much more than soup. And just look at all the things you can make with the immersion blender: salsa, pesto, pancake and waffle batter, smoothies, cheese sauces, gravies, homemade tomato sauce, Hollandaise sauce, whipped cream, apple butter, mayonnaise, ketchup, guacamole, and of course, the afore-mentioned soups. Wash it as soon as possible after use. The blender blade has lots of hard-to-reach spots, and if you let it sit for too long it can be hard to clean it completely. 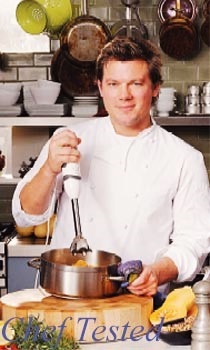 As soon as I finish blending something, I run the metal piece of my hand blender under VERY hot water and give it a gentle scrub with a soaped-up stiff-bristled brush. Blend in bigger quantities. Immersion blenders work best when there’s a lot of blend-able stuff to work with. For best results, avoid small quantities and shallow dishes (you want the head of the immersion blender to be fully submerged in whatever it’s blending). If making a small batch of something, use the plastic beaker that comes with the blender. Move it around for best results. When using the plastic beaker, move the blender up and down as it blends so that it picks up everything and blends evenly. 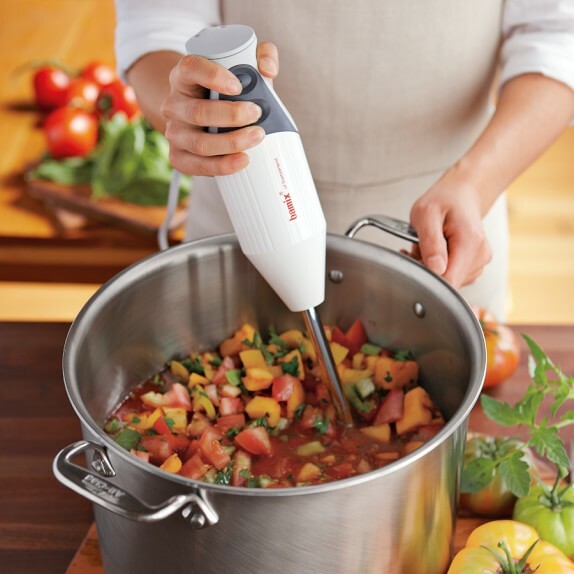 If blending a big pot of soup, move the blender in a slow stirring motion so you don’t miss any big pieces! Finally, let hot dishes cool for 10 or 20 minutes before blending anything. 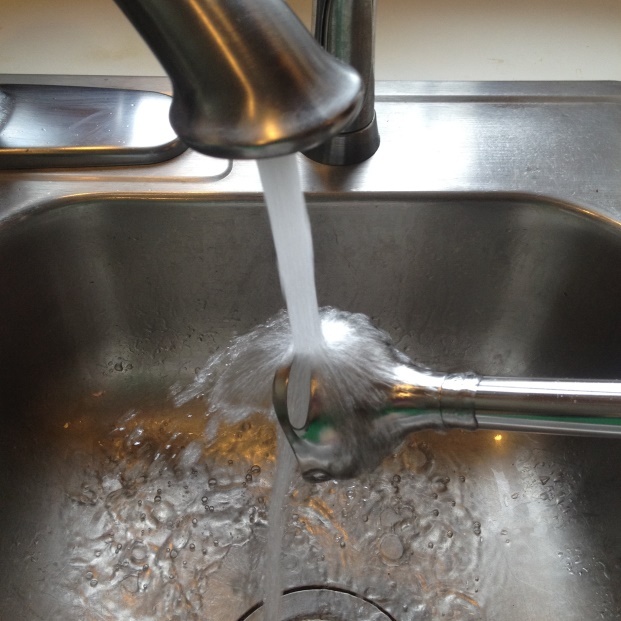 Occasional spatters do happen, so this step ensures you don’t get burnt if a spatter finds you.